An 11-year-old kid got the opportunity to cut the grass at the White House on Friday, to complete his wish he wrote a letter to The President Donald Trump about it in July. To read the whole post keep clicking on The Next Page. 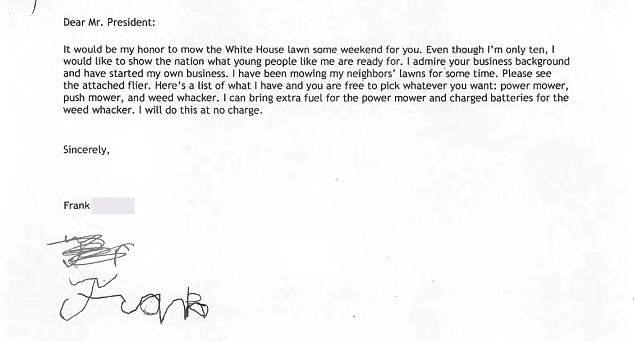 An 11-year-old child who wrote a letter President Trump a month ago inquiring as to whether he could mow the White House grass got his wish granted on Friday by the administration. White House Press Secretary Sarah Huckabee Sanders read the letter from the youngster named Frank at a briefing a month ago. She said Frank, from Falls Church, Virginia, “embodies the enterprising and ambitious spirit of America.” In his letter, the child offered to mow the lawn “some weekend” free of charge. “Even though I’m only 10, I’d like to show the nation what young people like me are ready for,” Sanders said the child wrote. Frank has since turned 11. Do You Know How To Get Rid Of A Double Chin In Simple Steps ? Selena Gomez Shames Justin In Public Calls Him ‘Jerk’!